One of our favorite Parisian clubs, Le Silencio, conceived by director David Lynch as a sophisticated watering hole for the more eclectic crowd, is pairing up with an equally artsy venue in France’s Luberon for a summer of art and farniete. 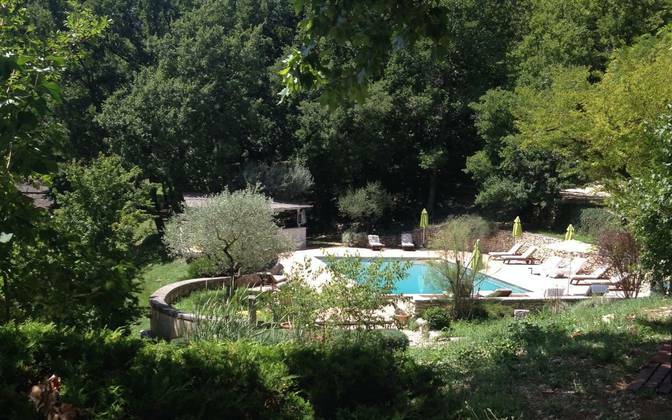 La Maison de l’Aiguebrun, nestled on 60 acres of rolling landscape in Bonnieux, is a stunning example of Provence living. Verdant landscapes, babbling streams, century old olive trees- the Luberon doesn’t get dreamier than this. Owned by the daughter of famed French directors Agnès Varda and Jacques Démy, the property will host Silencio members and guests throughout the summer for artistic events, readings, concerts and movie screenings around the bohemian poolside setting, complete with a fabulous bar and Silencio’s own cocktail classics. Ducasse-trained chef Armand Arnal will serve up locally sourced meals and fresh seafood dishes. Contact Isabelle Landry for availability in one of Eden Luxury Homes’ villas near Bonnieux, such as Mas Sabine or Bastide Valexane, we will arrange for your attendance at one of the events in this special summer art series.